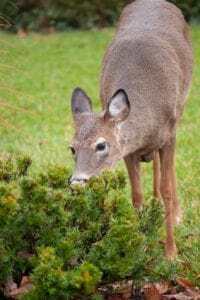 Pruning Rose Bushes | Fairway Green Inc. Roses produce a great pop of color in a home landscape. With a little pruning knowledge, you can make sure they don’t get overgrown and provide beautiful blooms for you to enjoy year after year. This blog aims to provide some basic information on pruning rose bushes that you have in your home landscape. There are many different types of roses on the market today that may require different pruning techniques, fertilizing and specialized care. 5 Items you will need to prune your roses? Protective eye wear: Safety first! Heavy long sleeve shirt and a pair of heavy jeans: The right clothing will help protect you from the thorns when pruning rose bushes. Good gloves:We recommend gauntlet-style gloves for extra protection up your forearm. If you do not have them, a good pair of leather work gloves will do. Pruning shears: We recommend Bypass blades, they overlap and make a clean cut like a pair of scissors. Pruning saw or loppers: If your roses have not been pruned in years, you may need a pruning saw or loppers to remove the larger branches. When is the best time to prune roses? Spring is the best time to prune rose bushes. Most of your pruning should be completed in the spring, when the leaves and buds start to come out. 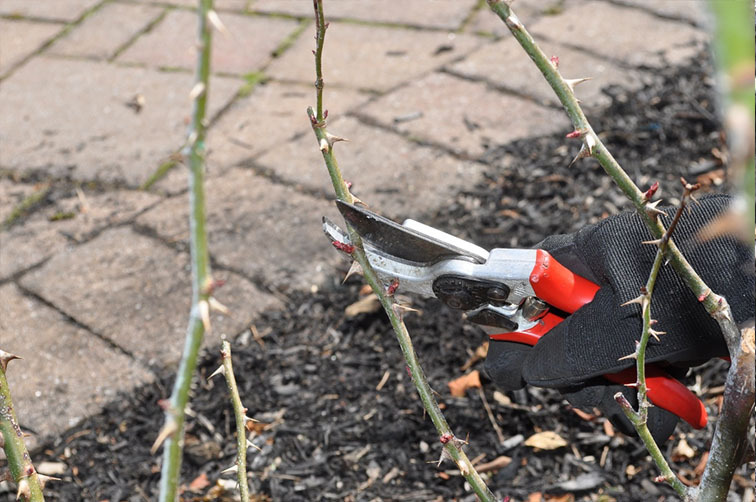 Pruning rose bushes is easy, cut out any old or dead wood and then trim the whole plant back by about half its height. In the summer you can “Dead-Head” the spent flowers. Deadheading refers to pruning the old blooms off before they produce seed hips. This will encourage more blooms and keeps your roses looking neat and tidy. Also, you can prune any branches or stems that have died or look diseased or broken. Late fall is the second best time to prune rose bushes. In New Jersey specifically, November is a good time to prune plants. 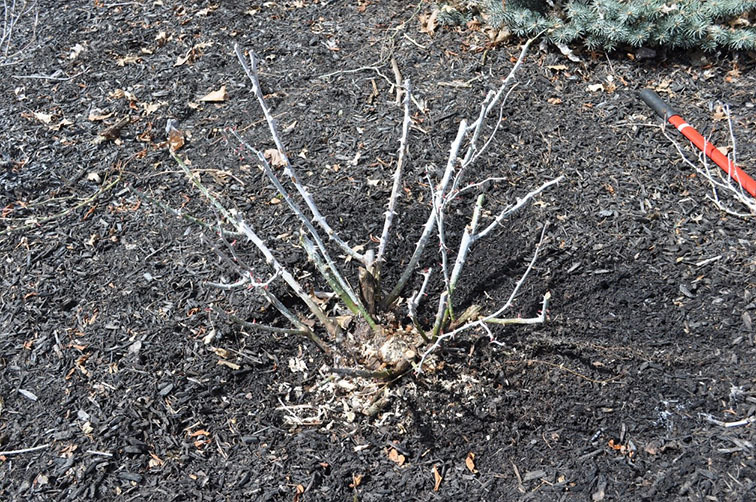 Prune to keep your rose bush from being too top heavy during the winter’s heavy snow weight. All crossing and rubbing branches should also be pruned on your roses. This is a basic pruning strategy for all plants once late fall rolls in. 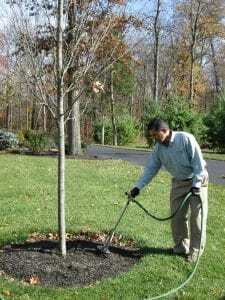 Remove any dead or diseased branches and foliage. We recommend cleaning your cutting tools frequently during pruning with a 10% bleach solution to prevent transferring potential disease issues between plants. Let’s start pruning your roses! But first, before we start, don’t be afraid to prune off a branch. Roses grow aggressively, so taking off a wrong branch will not kill your rose bush, in time it grows back. The purpose of pruning rose bushes is to encourage new growth, remove dead and broken wood, and shape the plant. A basic pruning cut: Prune by cutting 1/4” to 1/2” above an outward-facing bud/eye. New stems will grow in the direction of the bud, the goal is to encourage them to grow outward, not inward. Make all cuts at a 45-degree angle sloping away from the bud, allowing water to run off. Notice the pruning tool is angled to make a 45-degree cut above a new bud. Start by removing broken branches and dead wood: Remove all broken branches first, then the dead wood. How do you know its dead? The color will be little off, appearing dark brown or even black, it may also look shriveled. Also, you can make a small cut into the plant to see just inside the thin layer of bark, if its brown it’s dead. You should remove all dead wood when pruning rose bushes. Remove dead branches when pruning rose bushes. Next open-up the center of the plant: When pruning rose bushes, start at the base of the plant take out all crossing branches, which can rub against each other causing damage and promote disease. The goal is to have upward reaching branches with an open structure. Think about the roses you buy in your local garden store, there is only a few large upward branches, this is the look you want. Remove any thin and weak looking branches, the basic rule of thumb is to remove anything thinner than a pencil. Pruning height: Prune to the height you want your rose bush to be, while keeping a consistent height throughout your landscape. If it is in the back of a border or plantings, leave them a little taller. For the rose bushes in the front of other plantings, prune lower. For hybrid tea roses, the lower you prune, the bigger the flower and longer the stem. These are good for cutting and placing in a vase in your home to show off all your hard work. Leave them a little taller and you will tend to get more smaller blooms on shorter stems. This picture shows what a crossing branch looks like. Clean up all the debris: After pruning rose bushes, clean up all the clippings, and any old plant parts including old leaves that are in the surrounding area underneath the plant. Leaves and clippings can harbor insects and diseases, so they should be disposed of away from the rest of your landscape. Feed your roses: Roses love fertilizer and proper nutrition is very important, so we recommend feeding them with a high-quality slow release balanced fertilizer. Look for a fertilizer intended for roses. Start in the spring when the new growth is about 4 to 6 inches in length, and then every 6 to 8 weeks until the end of August. Roses need time to wind down for the year and go dormant so make sure to stop fertilizing in August. Many landscapers use Knock Out Roses to add variety and color to your landscape and require less maintenance. Generally, pruning is not needed until their second or third season, after reaching a mature height of 3 to 4 feet. Prune knock out roses at the same time as other roses. Knock Outs bloom on new growth so they should be pruned back by about 1/3 of their height. Keeping in mind the overall finished shape you are looking for. Knock Outs tend to grow in spurts, they bloom, then rest, then another bloom. If a mid-season trim is needed, it is best done following a bloom, while in the resting phase. Deadheading will also help to stimulate new blooms. Knock Outs tend to produce a lot of rose hips that will inhibit flowering and triggering dormancy, so trimming them will keep your Knock Outs blooming all year long. Rose hip or rosehip is the fruit of the rose plant. It is typically red to orange but may be darker in color on some species. Rose hips begin to form after flowering, then ripen in late summer through fall. Leave rose hips on through the fall and winter, they tell the rose it is time for winter dormancy. 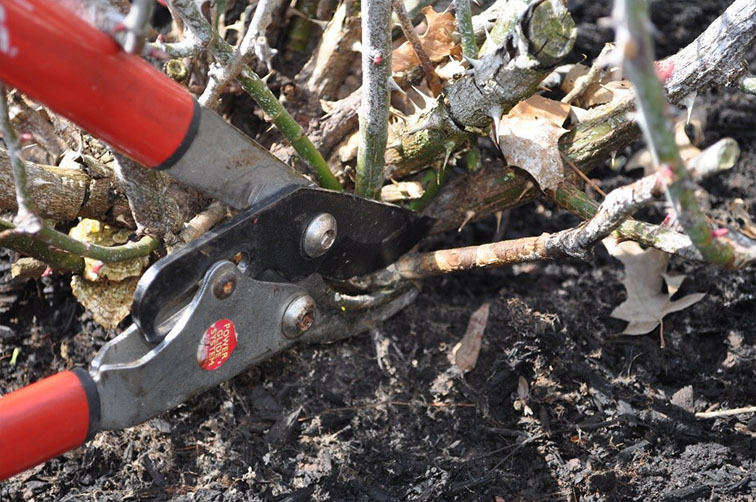 Pruning rose bushes is vital to the health of the plant, it helps prevent disease by removing areas that may harbor infestations and encourages flowering. Your roses may look stark after a good pruning, but roses grow very aggressively and will fill in quickly. It’s almost impossible to kill a rose bush by over-pruning. By following these few simple steps will help ensure your roses are happy, healthy, and will provide you with a season of beautiful blossoms. 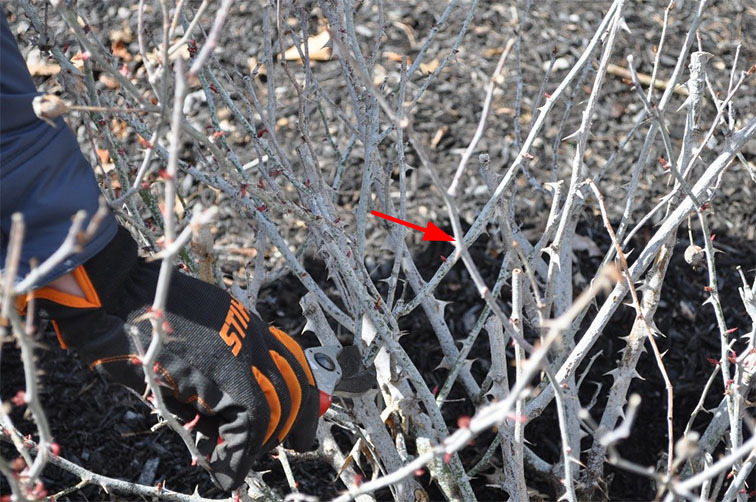 If you have any questions regarding pruning rose bushes and are in our service area, please give our office a call at 908-281-7888 or request an estimate.